Our Lake Atitlan Private Family Tour to Chichicastenango Market can help make sense of the chaos and clatter of this unique experience. This town is famous amongst tourists and travelers who are on private family tours to Chichicastenango. Its market is on Thursdays and Sundays, where traditionally dressed villagers in a kaleidoscope of colors, come to sell their very colorful textiles, fruits, vegetables, flowers, handicrafts, food, pottery, wooden boxes, condiments, medicinal plants, candles, pom and copal (traditional incense), cal (lime stones for preparing tortillas), grindstones, pigs and chickens, machetes, and other tools. In the central part of the market plaza are small eateries (comedores). The Quiches are very proud of their heritage and ancient traditions. Their inhabitants are dedicated in great part to agriculture. Each community has its patron saint festivals “cofradias” (brotherhoods) and religious customs, which are mixed with pre-hispanic rites and Spanish religious ceremonies. They maintain strong bonds with their traditions, customs, and have great respect for the elderly. Although parts of the market a very commercial, there is much mysticism in the air. You will be amazed by the religious blend that exists, where colonial Spanish Catholicism, modern evangelism and ancient Mayan tradition, blend in a uniquely harmonious fashion. 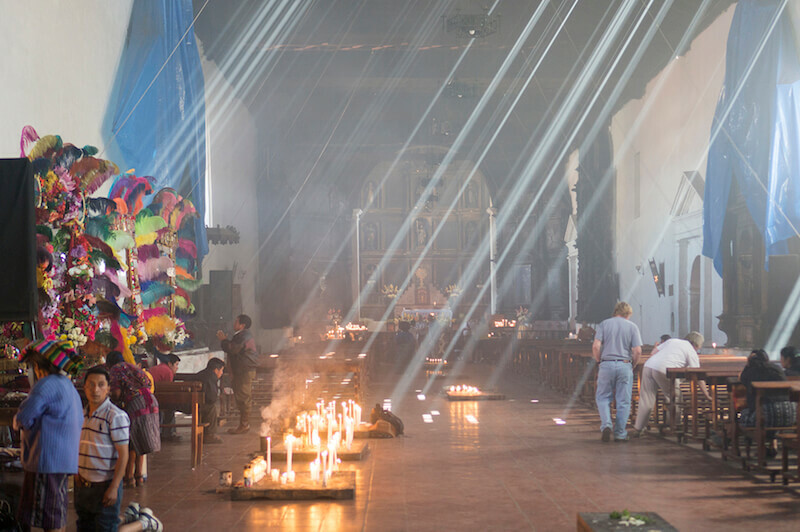 There is something deeply moving about watching a Mayan Indian or shaman, engulfed by incense and surrounded by flowers, praying to a catholic God and at the same time practicing ancient Mayan rituals, all in an old Spanish colonial Cathedral. Next to the market is the 400-year-old church of Santo Tomás. It is built atop a Pre-Columbian temple platform, and the steps originally leading to a temple of the pre-Hispanic Maya civilization remain venerated. K’iche’ Maya priests still use the church for their rituals, burning incense and candles. In special cases, they burn a chicken for the gods. Each of the 18 stairs that lead up to the church stands for one month of the Maya calendar year. Another key element of Chichicastenango is the Cofradia of Pascual Abaj, which is an ancient carved stone venerated nearby and the Maya priests perform rituals there. Visit the colorful cemetery, the modern sculpture garden dedicated to the Mayan calendar cycles, the indigenous mayor’s office, and the sacred hill Pascual Abaj. Each December 21 is the festival “feria” of Santo Tomás, the patron saint of Chichicastanenago. The days leading up to December 21 local dancers perform the Palo Volador. From an early age the women here learn the art of weaving on a waist-heel loom. The huipiles they make carry symbols that represent the universe as well as lightning, corn, cardinal points, the sun and a beveled bird. The men weave the belts and wool jackets for their black suits. The jacket and pants are very similar to those used by Spanish soldiers during the colonial times. The wooden masks that the dancers use bringing them closer to their gods are also manufactured in Chichicastenango. A mask factory and a warehouse storing all of the costumes for the dancers and renting the outfits, is located in the last house on the trail to Pascual Abaj. There are fourteen cofradias (brotherhoods) in Chichicastenango, each with six to eight brothers guarding a saint, which is kept in the house of the first mayor. The saint is only taken out for processions and festivals. The most important occupation among the Quiches is that of a Maya priest or Chuchkajau (motherfather). He possesses powers that allow him to mediate between believers and the gods. He performs special rites, and points out the proper days for planting and harvesting. The festive days of the Christian calendar are celebrated with fireworks and music on the 17th, to 21st, of December in honor Santo Tomas. Processions and traditional dances like La Conquista and El Torito take place. This is one of the three towns where the daring acrobatic act El Palo Volador of pre-hispanic origin honoring the sun is performed. It is here, in Chichicastenango, that Father Francisco Ximenez in the 17th century discovered the Popol Vuh, the illustrious Mayan bible. $40 per person plus transportation.